Our sarouels are a look apart and a step beyond the ordinary -- beckoning your inner Scheherazade! 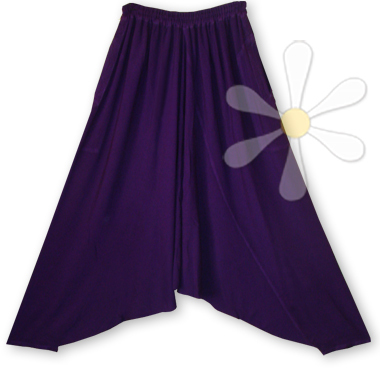 Extra-wide sarouels with long, low barely-there inseam are worn from Morocco to Egypt, Anatolia to India, Japan to Thailand. What do they know that we don't? Could it be that comfort trumps crotch-tight jeans? That in the west we are so obsessively body-conscious we favor constraint and restriction? Whether you stride like Athena or dance like Salom�, free yourself with ease of a skirt and the coziness of pants! The high-quality workmanship is apparent inside and out from the french seams to the trapunto-stitched pocket tabs. What's not to love?